"My friend says I was not a good son..."
William Stanley Merwin has been garnering praise for his poetry, translations, and prose since W.H. Auden awarded his first book, A Mask for Janus (1952), the Yale Younger Poets Prize. For over five decades, Merwin has been a major presence in American poetry, developing a reputation for an impersonal style that abandons punctuation. The son of a Presbyterian minister, Merwin began writing hymns as a child. He has said "I started writing hymns for my father almost as soon as I could write at all. But the first real writers that held me were not poets… and it was not until I had received a scholarship and gone away to the university that I began to read poetry steadily and try incessantly, and with abiding desperation, to write it." 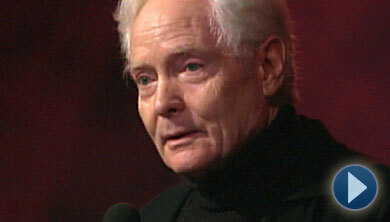 Merwin has published over 20 books of poetry including The Shadow of Sirius (2008), which won the Pulitzer Prize, Migration: New & Selected Poems (2005), which won the National Book Award, The River Sound (1999), which was named a New York Times Notable Book of the Year, and The Carrier of Ladders (1970), which also won the Pulitzer Prize. Merwin currently lives and works on an old pineapple plantation in Hawaii. To read this and other poems and translations by W.S. Merwin, as well as biographical information about the poet, please visit the Poetry Foundation Web site.